Already being a bit of a Zachary Levi fan-girl, I was fairly confident It wouldn’t take much for me to want to join the #Shazamily. See? It’s too late for me! RUUUUUUNNNN. However, the greatness of Shazam! definitely doesn’t rest purely on his shoulders – he has an incredible cast and some fantastic comedy behind him too! In a world that relies on a wizard, named Shazam, to keep the seven deadly sins at bay – a pure hearted soul must be found to take up the mantle. Foster-kid, Billy Batson (Asher Angel), is chosen as the next ‘Shazam’. 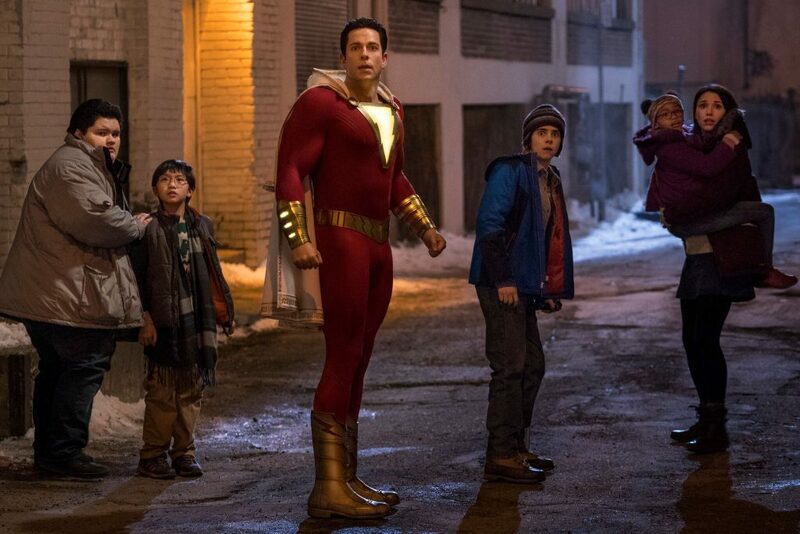 With only the guidance of a fellow foster-kid/superhero fan-boy, Freddy Freeman (Jack Dylan Grazer), Billy must learn to harness the powers of Shazam before the seven deadly sins have free-reign over the world. From start to finish Shazam! absolutely nails the ‘every kids fantasy’ vibe. That’s where it’s magic truly lies. You willingly suspend your disbelief to swallow crazy situation after crazy situation, because they’re the kinds of situations and obstacles a kid’s hero-fantasy would definitely involve. It gives a very realistic portrayal of what kids today might do in the situation our two leads find themselves in (turn to youtube) and our hero’s journey to really ‘becoming’ a hero is believable (and somehow not cheesy). 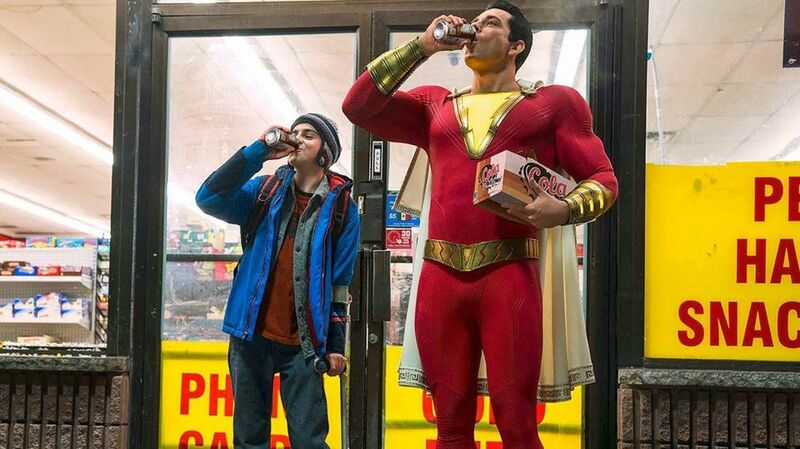 It’s possible that the comedic elements make some heavy content seem lighter than it should, but I think that also highlights the authentic childhood fantasy feeling of Shazam!. Finding an armed gun robbery scene hilarious, in hindsight, can be a little guilt-inducing when you think about how commonly such situations are effecting people around the world. But Shazam! allows you to get lost in the insanity of it all without giving you time to allow too much critical thinking. 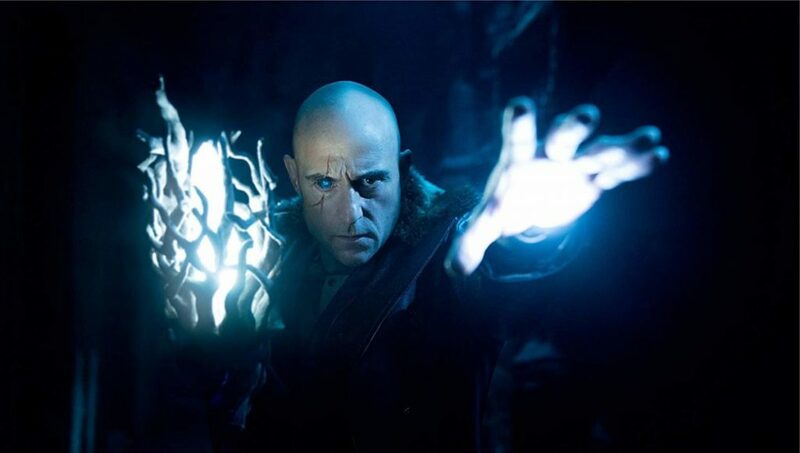 Shazam’s ‘big baddie’ is brought to us in the form of Mark Strong, doing what Mark Strong does best – being villainous. I think he did the best he possibly could with the role and lines given to him. 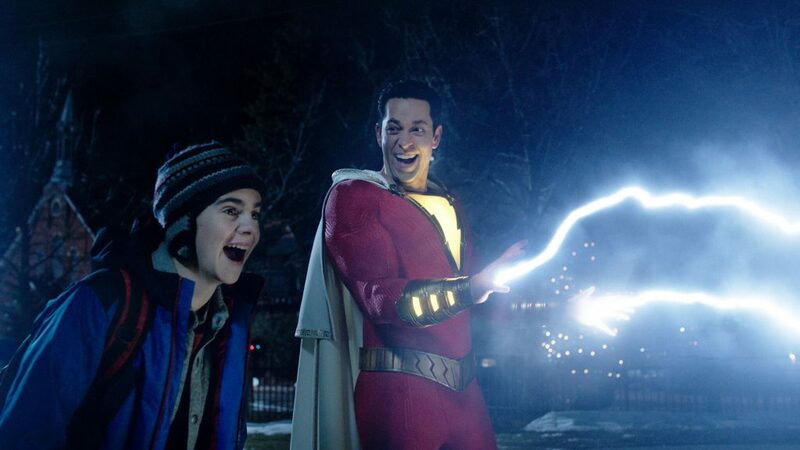 The thing I find a shame with Shazam, is that it feels like the perfect family superhero film, something for people of all ages to enjoy and get pumped about… except for a few scenes. It’s a little jarring to jump between childhood fantasy, triumph and school bullies to fairly graphic violence, darkness and genuinely grotesque monsters. It’s still great and I loved it all, but I feel a little sad that kids the same age as the some of the younger characters probably won’t/shouldn’t get to see it. At the end of the day, Shazam! is just a whole lot of fun! It serves up the laughs, pure delight and a huge helping of ‘the feels’. It’s one I’m confident I will be seeing a few times, as I’m already super keen to grab a bunch of friends and head straight to the nearest cinema for my second viewing.